When the craziness of move-in subsides and you find yourself searching for something to bring creativity and joy back into your life, the theatrical productions hosted by the university and Oxford community may provide the perfect escape. On campus, the Gertrude C. Ford Center hosts events every semester, including nationally touring Broadway productions, choral concerts and orchestra performances, often with a special discount for students with university IDs. 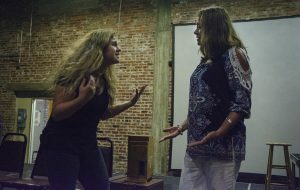 Grace Wolff and Susan Bradley practice a scene from “Brighton Beach Memoirs” during rehearsal at the Powerhouse on Tuesday. Photo by Marlee Crawford. But the Ford Center isn’t the only place to find fresh theater on campus – the theater department hosts straight plays and musicals throughout the year at Meek Auditorium and Fulton Chapel. This fall, the department will be showing “Blithe Spirit” Sept. 29 through Oct. 15 in the Meek Auditorium and the hit musical “Chicago” Nov. 3-5 in Fulton Chapel. In the spring, students can check out the post-apocalyptic rock ‘n’ roll musical “Zombie Prom” Feb. 16-25 in the Meek Auditorium and the Shakespearean classic “Macbeth” April 20-22 at the Ford Center. Auditions for university productions are open to anyone in the Oxford-Lafayette community. “I think a lot of people get confused because they think, ‘Oh, you have to be a theater major to audition for this,’ when really, no, you just have to audition,” Brandon Skaggs, project coordinator for the university theater department, said. Skaggs said the department is about artistic expression for everyone in the community. Tickets are available online or at the UM Box Office, and there are discounts for students, university faculty, senior citizens and children. In addition to the four mainstage shows, the university also hosts the Ghostlight Repertory Theatre, a completely student-run, directed and produced organization, which performs several shows throughout the school year. Any student interested in getting involved with Ghostlight can visit ghostlightrep.org for more information. In and around Oxford, the Yoknapatawpha Arts Council sponsors shows that are also open to anyone in the community to see or participate in. 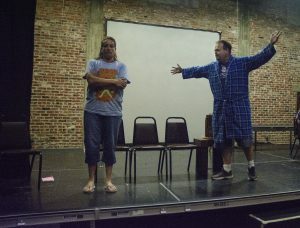 Jaime Adams and Geoff Knight practice a scene from Brighton Beach Memoirs during rehearsal at the Powerhouse on Tuesday. Photo by Marlee Crawford. On Aug. 24-25, Theatre Oxford will be performing “Brighton Beach Memoirs,” and from Sept. 29 through Oct. 1, it will be hosting the Ten Minute Play Festival, which showcases local talent in performance and writing. All submissions to the festival are original works that have never been produced before. If the spotlight isn’t the place for you, there are always volunteer opportunities with the YAC. Theatre Oxford also offers student discounts to its shows, and more information about the upcoming season can be found on theatreoxford.com. Whether you’d rather be on stage or in the audience, Oxford isn’t lacking in opportunities to perform or be entertained. Don’t be afraid to take a risk and take part in supporting the rich arts community we have here.